"Diesel PunX" Single Available NOW! Hey Everybody! Today we’re excited to release the video for “Diesel PunX”, the 2nd single off the Cherry Poppin' Daddies upcoming record BIGGER LIFE, which will be released on June 14th. The single will be available for streaming and downloading at the end of this week. So please check out the video and help us build some righteous momentum! 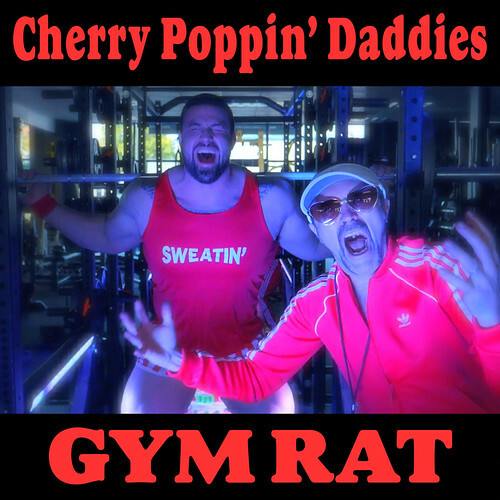 "Gym Rat" Single Available NOW! "Gym Rat" Official Video Out NOW! Hey Everybody! Today we are releasing the video for “Gym Rat”, the first single off our soon to be released, new album BIGGER LIFE (out June 14). “Gym Rat” will be available for streaming/purchase this Friday, March 15th! Check out the video now! CPD on WHYYTV's On Tour! Check out this cool career retrospective of the Cherry Poppin' Daddies, thanks to On Tour! This is Steve Perry the singer/bandleader of Cherry Poppin Daddies. I have some bad news. My beautiful wife, business partner and the love of my life, Yvette (Cherry Perry), received a dire colorectal cancer diagnosis on the day before Valentines day this year. Our adorable little family (our youngest is 8) is beyond devastated. For this reason, I am canceling all CPD shows going forward, for the time being, in order that I may be her main caregiver as she faces this difficult and scary fight. Please accept my sincere apologies. This has been very sudden and the outlook is not at all certain. When, god willing, she is all clear and stable again I plan to resume playing the joyful music that we have been making all these many years, an avocation that has become the work of my life. But for right now, Yvette needs me as her husband and her health care advocate. My kids need me at home to keep the trains running on time and to cry with. I am nearing completion of what I feel might be our best record- a skacore punky thing that I am stoked on, AND I was about to announce a special event that would be incredibly fabulous… now the status of that announcement is up in the air. If the fates allow we will carry through with these projects as soon as we can and I will keep you updated here. But for now, its all about being with my best friend and soul sister #1 as she fights for her life. None of this is anybodies fault- its just one of those things. As for me, I look forward to spending lots of time with Yvette and as a result of our proximity becoming a better, wiser, and more compassionate person. Love you guys and appreciate all the support. There is a lot of good in this world. Never a day goes by that I don’t realize how precious you all are to me. I intend to pay it forward with goodness of my own. I’ve come a long way from the snotty, prickly little 80’s punk I started out as. You have all taught me so much. More big art coming your way! I promise. Go buy some stuff here on daddies.com and I will sign it and send it to you asap. "The Ding-Dong Daddy of the D-Car Line"
For the 20th Anniversary of the Zoot Suit Riot recording we are releasing the official video of Ding-Dong Daddy. This song has been used countless times in TV dance shows, stage shows, and not to mention having been our stage show closer for years. So its time to give Ding-Dong Daddy some video love. The story of how I came to write this is as follows… I had this acquaintance who approached me one day and said “Hey I was demo-ing a house the other day and I smashed my hammer through a wall and between the joists I pulled out this old yellowed paper. I saw the headline and I knew I needed to get it over to you”. The headline read “Ding Dong Daddy Gets Short Term”. I scanned the piece and it seemed that in San Francisco during the war in the 40’s all the able bodied, young cable car conductors were drafted so the city began to fill the slots with older gentleman and basically whoever they could find. One of these hires was a portly, balding ex- Lion tamer (?!) named Francis Van Wie. Francis used his “man in a uniform” charm and conductors position to woo a number of lonely ladies on his cable car route. He ended up actually marrying 13 women before he was inevitably found out! This lovable lothario spent time in San Quentin for the offense, but his unlikely story ended up being a sensation nationally. After his release he somehow got married a couple of more times and always to great acclaim. Such was his notoriety that he ended up, many years later, in the 60’s as an MC in the world famous burlesque club in Oakland, the El Rey Theatre, where Blaze Starr and Tempest Storm did their bump and grind. Obviously, when I finished reading this story I rushed home and wrote a song about it. To get your own 20th Anniversary of Zoot Suit Riot, available in Vinyl, CD and download forms, visit me over at daddies.com and I will put it in the mail for you and sign it myself. Don’t forget to process your order (at PayPal) or I won’t know to send it. ** = Bonus tracks available only via purchase of CD or Digital Download. Order the album on iTunes here, or order the CD & Vinyl here! Zoot Suit Riot Tour Dates! For the continued celebration of the release of this 20th anniversary record we will follow-up our East Coast tour with a West Coast tour where we will play down the entire album, in order, and in its entirety, live. Some of these shows are already on sale (follow the tix links below) and some will be put on sale soon. Stay tuned for more information on tickets soon. Zoot Suit Riot 20th Anniversary Edition Available Today! Who releases a record on Friday the 13th? Cherry Poppin Daddies do! I’m spending my day sending out the pre-orders of Zoot Suit Riot the 20th Anniversary Edition all around the globe! This is the definitive remixed and remastered version of our 1997 classic, with 6 extra live tracks! Available also for the 1st time in history on vinyl… silver vinyl! This is the one you would be familiar with if you 1st heard about us from MTV in 1998. Come subscribe to our YouTube channel and see our upcoming video world premiers... a veritable landslide of new released stuff, it’s free. If you want to order a copy for yourself, I will sign it and send it to you. Go to daddies.com and don’t forget to process it through Paypal and I will get it right out! Zoot Suit Riot 20th Anniversary Edition and Tour! Zoot Suit Riot 20th Anniversary Edition! 2017 marks the 20th Anniversary of the release of our seminal, double platinum, worldwide swing smash Zoot Suit Riot, and to commemorate the occasion, we went back into the studio to remix and re-master the entire record from the original 2 inch tapes! We also dug out some vintage 24 track recording of us playing live and ridin' high in 1998 and mixed some of that stuff in to include in a package that will be the definitive, audiophile friendly 20 song version of Zoot Suit Riot. The 20th Anniversary Edition will be available worldwide starting January 13, 2017 - but you can PRE-ORDER your copy now! In addition, we will for the first time ever be releasing Zoot Suit Riot on beautiful silver VINYL! The package includes a download card included so you can upload the new mixes to your computer, if you so desire. But why not listen to it on VINYL like the Gods should have intended! We took care not to ham-fistedly compress and over limit this baby so that the full dynamic range of the music (music crafted to actually have dynamics) would shine through. Pre-order the album on iTunes here, or pre-order the CD & Vinyl here! The LP opens up onto a deluxe gatefold sleeve featuring a vintage photo of us onstage from back in the day… the birthing pangs of it all… when the neo-swing scene was a still burbling up from the underground: when people still responded to Drunk Daddy with slam dancing, when the Stern Brothers were still in Royal Crown Review, when Jump with Joey was rippin’ up the King King at 6th and La Brea with equal parts Swing and Jamaican Boogie… a landscape of small tinsel stages and confused audiences… right before the swing explosion codified everything. (Sigh) Those really were the days. Zoot Suit Riot was a compilation and most of the songs on it were culled from our earlier albums. The earliest recording we used, Dr. Bones, was from 1989! We got together in 1996 to record the final 4 tunes so that the record would have some new stuff on it. Those last 4 tunes were: Zoot Suit Riot, Brown Derby Jump, No Mercy For Swine and When I Change Your Mind. When we recorded our early records, we had zero in the way of budget and so tended to rush through the mixing process out of necessity. For instance, when you hear me say “I think I am ready to sing it now,” at the end of ZSR, it was because the first take sounded pretty good to our engineer, Billy Barnett of Gung Ho Studio, so he called me in from the iso booth. I was supposed to be me warming up my voice. But I concurred with his assessment and so we just moved on to the next tune. As a joke, we left the thing I said in there. Now it’s on the sheet music :-). The song Zoot Suit Riot was inspired by my love of jump blues, boogie and the Pachuco culture of 1940’s Los Angeles. As the neo-swing scene grew throughout the early 90’s I wanted to write an “anthem” for our scene to kind of distinguish the swing tribe from every other tribe in the underground. I wanted it to be what “My Generation” was for Mods. For the song, I appropriated a despicable and unfortunate actual historical event, the 1943 “Zoot Suit Riots” that happened in Los Angeles. The violence between the zoot-suited, jump blues listening Mexican Americans and the angry, drunk, misguided sailors who attacked these young men solely based on their “weird" clothing and otherness, was a shameful event in American history. To me, the simplified duality I used as I wrote the song was: we swingers were in solidarity with our counter cultural ancestors the "Zoot Suiters" and we were opposed to the “sailors” who represented the squares who weren’t yet hip to our growing communal jive. I pictured the future of the swing scene as being rougher, realer, weirder and more of a hybrid, like the punk or psychobilly scenes... like if the Clash or the Kinks were a swing band, except with revived speakeasies, martinis, couples dancing and equal amounts of men and women. That was, and still is, if I can be totally honest, my vision of the exciting place we, the swing “scene", should be striving for as a musical movement. For the release of this 20th anniversary record we will be reviving that dream by doing a couple of tours on both coasts where we will play down the entire album, in order, and in its entirety, live. Some of these shows are already on sale (follow the tix links below) and some will be put on sale soon. Stay tuned for more information on tickets soon. It’s been a great 20 years since Zoot Suit Riot brought original swing music back to the top of the pop charts! Who would have figured that all these years later that every single city you go to all around the world has a swing music scene! So many people have had the pleasure of swinging out on a rock step, tying up a windsor knot, nursing a cocktail next to some hottie, or pulling away from the curb in some slow rollin' Lincoln Continental. Our scene is still evolving and who knows, maybe someday we will morph into something more like my original Diesel PunX vision? I know I’m still working on it. There is a lot more experimenting to do, but let’s celebrate how far we all come! CPD is proud to have contributed what we have to music history so far, and we look forward to an even wilder future. Hit me up at Daddies.com and I will send you the new recordings myself. Let’s build on this dream! The world is not enough. See you in the club. The Cherry Poppin' Daddies are excited to premiere their music video for "That Lindy Hop" off of the new album The Boop-A-Doo. Watch it here now and see future videos first by subscribing to the Daddies' YouTube channel!